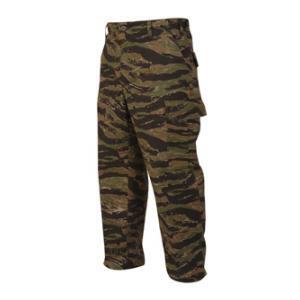 Propper Genuine Gear 6 pocket BDU pants are made of a 60% Cotton/40% Polyester Ripstop blend. Military-Inspired construction and authentic fit. It has two front slash pockets, two rear pockets with covered buttons, two large three-pleat cargo pockets, adjustable waist tabs, reinforced seat and knees, Zipper fly with button closure and drawstring bottoms. Import.